From the profit making angle, a dog boarding business is sure to succeed if managed well with adequate facilities and staff to help out. It's possible to launch such a dog habitat on a small scale taking in only a few dog boarders at a time and at the same time providing quality services which ensures a nonstop flow of clients. Large and upscale resort style facilities may also be set up providing the ultimate in luxury and services. The underlying fact here is you have to love what you are doing; i.e. only a genuine dog lover will understand the needs and care demanded by a dog and provides adequate attention to all those factors. You can set up your dog boarding facility in any location which you think will appeal to members of your locality. A dog habitat in the heart of the town could prove to be convenient for dog owners for easy pick up and drops etc but it may be a bit noisy and stressful for the dog boarders in particular. On the other hand, setting up a dog boarding hotel or resort in a quiet an secluded location with lots of free space around for the dog boarders to run around and have exciting and fun filled outdoor activities can seem more appealing. Dog owners are very particular with food habits of their dogs. So the dog habitat should be prepared to provide the best of nutritious and wholesome food. Special dietary needs should also be attended to and accepting food from the dog owners is also not a bad idea. Launching a website describing your dog habitat in detail, complete with pictures and information as well as ongoing rates will definitely boost in business. The owner will have to apply for and pay the required fees necessary to procure a dog boarding business license. 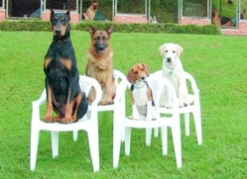 Insurance is also necessary to protect against injury, accidents and illness of dog boarders. A well stocked medical supply with a vet on call at all times is absolutely essential. Dog food of various brands has to be stocked since each dog has different meal preferences. A few toys to interest the dog boarders will help to reduce boredom. Employing experienced groomers and providing specialized grooming services like massage, spa treatments, shampoo baths, nail care etc. at extra costs will add to the profits. There should be adequate number of staff in your dog habitat to engage in petting sessions, taking the dogs for one-on-one walks, supervising group play and basically to spend time with those since majority of the dog boarders do not like to be left alone.